A busy weekend ahead of me! Doing a dinner party tonight for an out-of-town friend who is around just tonight and tomorrow I have my monthly-ish dinner club. The theme will be grilled, and my wife and I are bringing a variety of grilled salads! I'm seeing my in-laws on Sunday for a late birthday celebration (for me!) and will be meeting more friends for drinks at my new favorite bar. 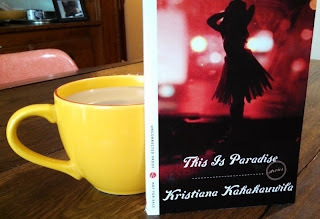 Reading time will not be great, so I'm especially glad my weekend read is this slim volume of short stories: This Is Paradise by Kristiana Kahakauwila. What are your weekend plans? What are you reading? What a fun weekend! I'll be busy this weekend too so won't get much reading done either. I've heard great things about it so I hope you enjoy! Sounds like a great weekend--so much entertaining. I stand in admiring envy of you. And happy birthday! I really loved This Is Paradise. Thought it was a terrific story collection. Hey, weird question...would you ever want to me my bookish date for any author events that I go to in the Boston area? Most times I end up going by myself and it would be fun to have a friend sometimes. P. S. Have you ever tried grilling watermelon? It's AMAZING. Might be good with your grilled salad theme. Happy late birthday :) Sounds like you have a fun weekend planned! Hooray! I'm in the middle of A Prayer for Owen Meany...sigh, it's wonderful! Sounds like a fun, busy weekend! And happy belated birthday. Happy belated birthday! Sounds like you're having a great weekend.